Once the exotic playground of Roman emperors Julius Caesar, Nero, and Caligula, the one-time seaside resort of Baia just north of Naples enticed and tickled the fancies of the first-century elite. Horace described it as “Nowhere in the world is more agreeable than Baia.” Pliny praised the medicinal qualities of the water. Rich Romans built magnificent villas along the coastline that have since become submerged under water. Because the land of Baia and its surroundings are a volcanic area, the land has dropped six meters over the centuries. Today you can take a glass-bottom boat out from the harbor to view the ruins of these one-time sumptuous villas. 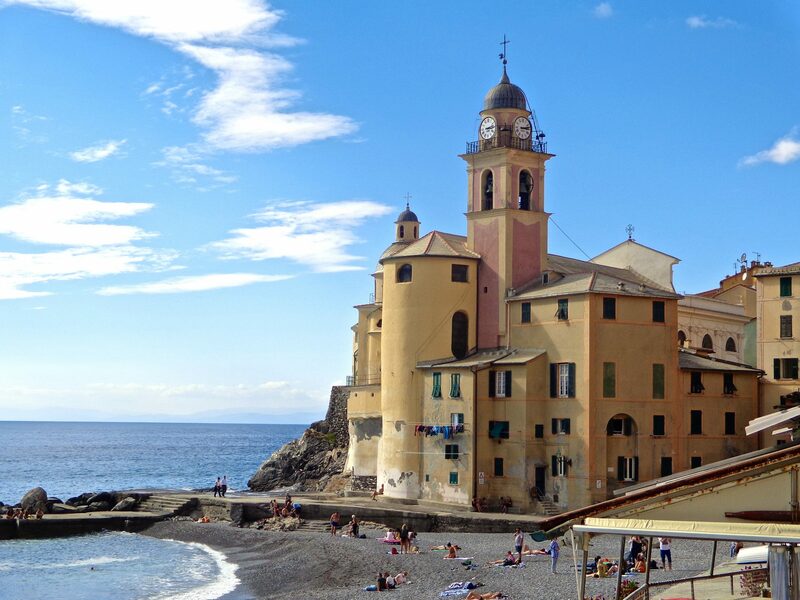 Desirable for its healing thermal baths, mild climate, and luxurious surroundings, Baia was conveniently situated in Campania of Southern Italy near the western corner of the Bay of Naples. The very essence of Baia inspired a spirit of idleness and pleasure among the nobility, the rich, and the famous nearly two thousand years ago. Today, the thermal bathing complex is but a faint shadow of its former magnificence. I had the opportunity to explore the complex while staying in Napoli. My imagination was put to use as I strived to envision the ancient thermal structure at the height of its beauty. The labyrinth-like complex with its three terraces brought a distinct feeling of the immensity and grandeur of former days. Time and the shifting land due to seismic activity have ravaged it to skeletal dimensions. A fascinating fact is that some of the most notable Roman historical events happened in Baia. To begin with, Nero had his mother, Agrippina, murdered here. 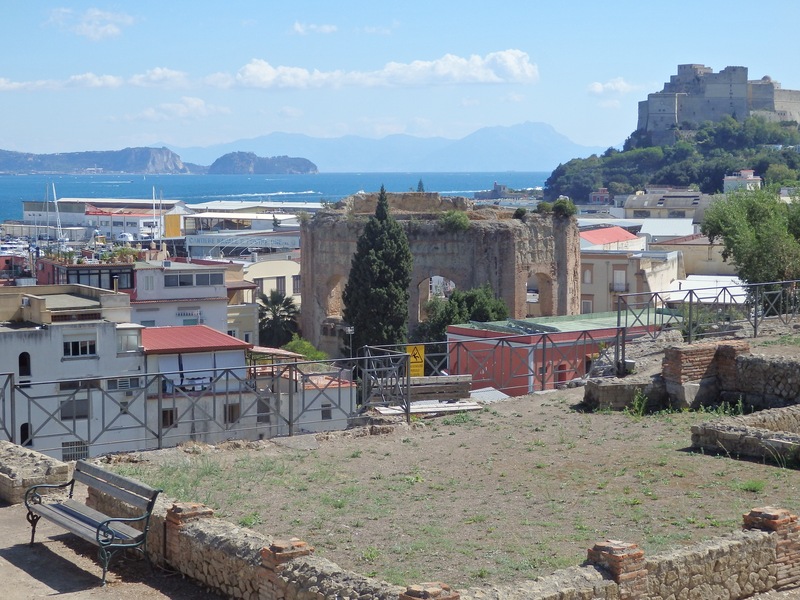 Caligula built his famous bridge extending from Baia to Pozzuoli. Hadrian died here in 138 AD, and it is said that Cleopatra was staying in Baia when Julius Caesar died in 44 BC. Today, Baia’s archaeological park is a lifeless shell of a bygone era. The silence of the ancient city is a bit chilling. Very little is left of the thermal establishments, promenades, terraces, and porticoed gardens. What we do know is that these public facilities provided the Romans with three kinds of baths; a frigidarium (cold water), a tepidarium (warm water) and a caldarium (hot water). Adjacent to the pools were lavishly decorated rooms for relaxation. There were also massage rooms, saunas, exercise rooms, sitting, and reading rooms. This was not just an area to bathe, but it was also used for socialization, relaxation, and meditation, as well as a place where important decisions were made. Even though wealthy Romans bathed in their own homes, they used the public baths frequently. Below, a concrete dome over a pool of water once called the Temple of Mercury (nicknamed the Temple of Echoes for its acoustical abilities), was a bathing pool. Now the water shines inky black in hollow stillness. The Temple of Mercury, which was not a temple but a bath, dates back to the Augustan era and is believed to be the oldest example of a large dome. Like the Pantheon in Rome, it has an oculus in the dome roof, as well as skylights. A natural spring used to flow into the room but since the seismic shifting of the land known as bradyseism, the spring is now underneath the temple water. The Villa of the Ambulatio seen on the lower level above (must use your imagination some) was used for walks, reading, and as a retreat for its wealthy owners. While strolling through the back corner, I saw bits of beautiful mosaic flooring designed in black and white. The grassy area in the forefront may have been a large pool or a garden. Lower terrace of the Baths of Sossandra – Frescoes on the wall, though faded, can still be seen. The mosaic floors are behind the far iron fence. With my back to the complex ruins, this is what I see of Baia and the waterfront. The Temple of Venus stands domeless mid-picture. On the hill is Castello di Baia, a 16th-century museum. Here just outside the archaeological boundaries of the thermal complex you can see the remains of the Temple of Venus. Separated by a major street, it once was part of the thermal multiplex, topped by a magnificent dome seventy feet in diameter. Baia declined as the Roman Empire did and was invaded by the Saracens in the eighth century. It was then vacated as Malaria became a problem. What we see today is just a reminder, a monument, to the grandeur and elegance of Roman Baia at the height of its glory. Beautiful fotos. Been there twice. The first foto is of Miseno and the Bay of Baia is beyond. Beautiful fotos. Been there twice. the first foto is of the double bay of Misenum, the site of the Roman naval base and not of the bay of Baia which is beyond. So fascinating,the whole area is full of history. Lake Avernus and Lake Lucrino used to be connected(37bc) while the Roman fleet under Octavian prepared to attack Sicily(under Sextus Pompey) due to grain pirating.The fleet was built,trained,and prepared out of site,behind Portus Julius in the volcanic crater lake of Avernus.When the fleet was ready to sneak attack,they sailed into Lake Lucrino and out to the Gulf of Puzzuoli through a concealed channel. Thanks for such a Great Baia Site. I have blabbed enough for now. You can take a train from Montesanto. It takes about the same amount of time. They run every half hour. You can taxi as well. Just Google taxi from Naples to Baia and you will find options. Have a great time. It is well worth it. Thank you so much for this, we are traveling to this area in August and I saw the TV programme Alexander Armstrong in Naples earlier in the week, it showed Baia so having googled it and then read your site I have now booked a hotel close to the complex and can hardly wait! Just need to find the website for entrance fees etc, I love to do all the research and will visit your comments again. We will be in Rome after for the 3rd time in 14 months😁 just cannot get enough of Italy and it’s history. Thanks again. Ciao Jane, I am so excited for you! I am just like you…I can’t get over the fascinating history that is everywhere in Italy. I really enjoyed exploring the ruins of Baia. When you know the history ahead of time, it is so easy to imagine and really enriches your experience. Have a great time!! I hope you can get out to see some of these ruins. Hang in there…like the old saying goes, if you want something bad enough you will find a way. Sometimes it takes a while. All the best to you. Nice place,we have a Roman bath complex still in regular use here too,its in the beautiful Roman built city of Bath in south west England,you should pay it a visit,true living history.